Free Picture Fest direct from internet. Before Marcus Camilius Reform (after the battle of the Allia, in 390 BC, that led to the sack of Rome) the Army inherited the city-state model shared by all Etruscan cities, before Servius Tullius. The cavalry was quite reduced and included the 300 Celeres of the aristocratic class also called "knights", and the very core of the infantry was made of heavy hoplites, down to spearmen of all conditions, along a seven-levels depth system. Livy's Ab Urbe condita story of the seven semi-legendary kings of Rome since the death of Romulus is foggy about the composition of the army to say the least. The armament and war gear was Latin and there was a strong etruscan influence, therefore citizen-soldiers from Alba Longa (the ancestor of Rome). Hoplite equipment in 600 bc was for the wealthiest notables. And it was quite heavy, with bronze bands on the arms and forelegs. Servius Tullius re-organized citizens into five classes of "censi", based on their wealthiness. Namely there were forty centuries of "young men" and forty of "older men", all hoplites of varied equipments. The first were used to guard the city and the last to be sent in short campaigns. The same principle was used for the Comitatenses and the Limitanei a millenia after. Two centuries of "workers" were added for siege operations if needed. The Second class citizens represented 20 centuries of all ages but with a scutum, helmet, greaves and a small cardiophylax for some, a spear and a sword. They probably fought on the wings of the hoplitic line, backed by third class citizens, roughly equivalents in role and equipment to the later rorarii, 20 centuries fighting with a spear and light javelins, probably no helmet. The fifth and last class, the lowest level citizens were drafted to fight with slings and stones, and formed 60 centuries. The very last century, unlimited was composed citizens of all ages of the lowest condition imaginable, normally discharged of any military task. Tullius also reorganized the cavalry into a more sensible arrangements of 12 centuries, "knights" reinforced by the three centuries of aristocratic Celeres (Livy, Ab urbe condita, book one, I,43). In that mix, we can already see the Hastati and future Principes, part of the second class. Their equipment will change with time, but like the hoplites they were spearmen. Skirmishers were the third and fourth class, although it is well possible that only the first of the two was committed in campaign. The revered father of the "Second Foundation of Rome" effectively combined a newly formed 12,000 strong army recruited in the area and the effects of the epidemic that strucks the ill-prepared Gauls for a prolongated siege to force Brennus to sign a retreat agreement. Citizens had fled to Caere and the remnant of the army to Veii. Not only Camillius held the city, by reorganising the defence but also fell on the drunken and disorganized gauls and put them to the sword or having them rout. He was made Dictator, which allowed him to supposedly reshape the army to be better prepared (but without much precisions). Nearby peoples were apparently quite impressed by his feats and proposed a peace treaty that allowed Rome to expand its controlled territories by seventy percent. On the military side, he equipped troops with "pikes" instead of spears to better keep the Gauls at bay, while reinforcing the shields of the Scutum type by bronze rims to better resist Gallic longsword hits. He introduced pay for the army at the siege of Veii, and accepted the Licinian–Sextian reform laws in 367. But in fact little is truly known about the extent of his military reforms which are sometimes also called "Livyan" after Livy (like "polybian", see later), other than the fact about 330 BC, the Army counted a cavalry core of knights called the Equites (later distinguished between Consulares, singulares (-bodyguards), and "Privato", "Publico" according to their recruitment base, and infantry separated between the spear-and-sword armed Hastati and Principes, Hoplite-style Triarii which will also be described by Polybius, though with a different gear, and proper Camilian levies, the Rorarii and Accensi, plus the "leves", these low-level citizen normally never drafted. If the status of the Accensii is debatable (they were probably lightly equipped skirmishers), the Leves fought "ad pugnam" literally with their fists -or whatever they could have their hands on, clubs and stones. The Hastati was named after -obviously- the "hasta", the classic Roman spear. This gave no indication of rank contrary to the Principes or "first". The Hastati could afford basically a sword and were "hasta bearers", with the luxury of some armour likely a bronze helmet with cheekguards and a chest armour or Cardiophylax, "heart-protector" and possibly leather or whatever they could afford. As Rome and its citizens became richer, and probably with the influence of the Samnite wars, there was a transition at some point (unknown) from spear to javelin, although the latter never really disappeared, passed into the later heavy pila. 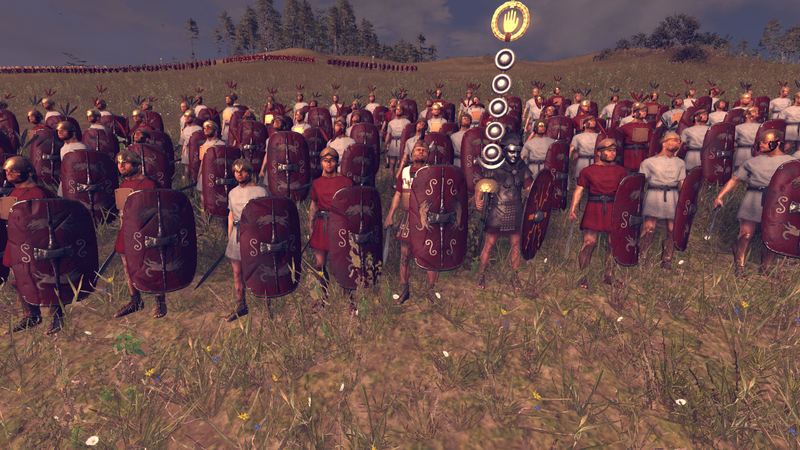 These citizens were really the backbone of all roman armies, placed the first rank to learn while fightning, given the task to tire the enemy and then retire to allow the more experienced and rested Principes to end the game. At least, given polybian accounts this was before the triplex acies, the most sensible arrangement, a cruel "trial by combat". Veterans passed into the Principes were survivors, either by luck or skills. In any case, Livy's depiction should be taken with a massive pincer of salt, as a second-hand, two centuries after depiction. Of course there are no such thing as Polybian modifying the Roman Army. He was only chosen because of his faithful (hopefully) depiction of the Roman Army as he saw it, on the span of about 53 years, in events following Pyrrhos invasion of Italy, defeat and death, Gallic Balkan's invasion, the subjugation of the Cisalpine gauls, the Achaian war (which nothing less than his father as the Achaean League's Strategos) to the fall of the Greek world, and throughout the three Punic wars (To be precise 264–146 BC in detail). This was indeed one of the most active period of the Roman history, one of the greatest extension. The father of Roman historiography, which most of the works are lost but fragments and the only first book of five. He also made a book (which survived) on the Numantine Wars, also describing the Roman armies in about 143 to 133 BC and their Hispanic, Celtiberian adversaries and notably Arevaci's Lusitanian revered leader Viriathus. Polybios desciption is precious material (he has been often called a "historian's historian") was actually present on campaign with the army he described, furthermore it is remarkably detailed, going through organization, pay, rations, hopefully unit types, but also their numbers, and gear. Thanks to hom we know how it was recruited and mustered, the legion's own duties, camp life and organization, how was the army on the march and deployed for battle, earned awards for bravery and disciplinary sanctions. For what we are concerned for, the Hastati was described, in his own translated words as "" and for the tactics: "(...) to the first ranks, or Hastati: and ordering the men to use their swords only, after their spears were done with, they charged the Celts full in front." According to Polybius, the Hastati legionnaire has a small breastplate about eight inches square (the "heart protector" described above) although round breastplates were also quite current. It is not also excluded to think many had full bronze breastplates (if old) certainly cheaper than the "Celtic mail" he described for the Principes. In that case, and like the latter, they probably use a padded garment over their tunic to reduce or stop blunt force trauma. They used likely Montifortino helmets of the B Type, less efficient than the more handy and lighter 'C' helmets introduced shortly before Marius reforms cheaply made because standardized and simplified. The Attic type had a long history and were still largely available (possibly taken as a booty) just like Italo-Corinthian helmets no longer used by the late third century BC, but perhaps by some officers for prestige reasons, with ample feathers, brush crests and/or horse tails. Polybius described these relatively high roughly conical or bell-like Montefortino helmets as having cheek-guards and a small neck-guard, plus a thick rim, but most importantly a top attachment for a pony tail, and/or feathers (more likely at the beginning) to -according to polybius "give the bearers a superhuman size". the Roman shield was four Roman feet high, two feet wide and curved, covered with "canvas and hide" (probably rawhide), and reinforced by an iron boss which also served for the bearer inwards as housing the handle. it also had six metal rings attached to its inside, probably to attach some canvas cover. Hastati (thanks to the Aemilius Paulus and Altar of Domitius Ahenobarbus monuments) wore waist belts, to which scabbards were attached (sword and Pugio), probably not plated with a simple buckle, but providing some protection in mid-waist. Button and loop fasteners could have been part of the belt as well. The sword was by then the Gladius Hispaniensis (adopted in Iberia by Scipio, hence its name) which was thicker and shorter than the Italic one, a derivative of the relatively long swords of the VI-IVth centuries. Still, this gladius is a bit longer longer than the later Mainz and Pompeii types. Soldiers could also have carried the Pugio, or general utility dagger quite common at the time. Polybius depiction of their throwing spears or "pila" is probably the most important: He is quite adamant there were two of different size, one smaller than the other. One was clearly for throwing, the other more for thrusting. And it was then not the "thin type" created after the marian reforms and known in Augustean period (like the Oberaden pila). Indeed according to Goldsworthy "contrary to deeply entrenched myth" these pila did not bend on impact to make any struck shield useless or prevent the weapon from being thrown back. If the bearer survived the hit, it was likely to hamper the shield enough to render it useless. Although its is still relatively unclear, it seems the Spanish Soliferum had quite an important influence on the design of these "reformed pila", with an iron part long and thick complementing a wooden shaft in a very compelling way. The heavy pila indeed was about the size of a man and could be used against infantry and cavalry alike with quite a formidable impact. This made every hastati still a "hasta" bearer, a spearman, as well as a skirmisher and a medium, well-rounded infantry. The universal infantry that will be further refined in the shape of the legionary modelled after the Principe during Marian reforms. Now let's turn to the master: "The spaces assigned to the cavalry are opposite the space between the two groups of tents belonging to the Tribuni of the two legions, at right angles to the line along which they stand, like a cross-road; and indeed the whole arrangement of the viae is like a system of cross-roads, running on either side of the blocks of tents, those of the cavalry on one side and those of the infantry on the other. The spaces assigned to the cavalry and the Triarii in each legion are back to back, with no via between them, but touching each other, looking opposite ways; and the depth of the spaces assigned to the Triarii is only half that assigned to other maniples, because their numbers are generally only half; but though the number of the men is different, the length of the space is always the same owing to the lesser depth. Next, parallel with these spaces, at a distance of fifty feet, they place the Principes facing the Triarii; and as they face the space between themselves and the Triarii, we have two more roads formed at right angles to the hundred-foot area in front of the tents of the Tribunes, and running down from it to the outer agger of the camp on the side opposite to that of the Principia, which we agreed to call the front of the camp. Behind the spaces for the Triarii and looking in the opposite direction, and touching each other, are the spaces for the Hastati. These several branches of the service (Triarii, Principes, Hastati), being each divided into ten maniples, the cross-roads between the blocks are all the same length and terminate in the front agger of the camp; towards which they cause the last maniples in the rows to face." The Hastati usually were posted, as seen above, on the first line of the Triplex Acies, which system was replicated later with the Marian legion. The checkerboard formation arranged Hastati's Centuries with large gaps between units, allowing them either to leave chariots enter "death traps" as well as elephants, and allowing the hard-pressed Hastati to retire quickly behind, or together with the Principes in one solid line. Admittedly, the Hastati were engaged only when the frontline skirmishers (Velites and possible early auxiliae, archers and slingers), short of weapons retreated behind their lines, passing through the same large gaps without altering order. defending on the nature of the attackers, the Hastati, now able to receive the bulk of the first shock in close order, presented their heavy pila and possibly closed ranks (the second line joining the first) instead of the relatively loose "killing space" usually adopted. In attack, the Hastati and Principes differed little in the way they engage the enemy: They throw a volley of pila, reaching the enemy line about fifteen yards only the for best effect and then charged very quickly to start their infamous sword's job, not leaving time for the enemy to recuperate from the volley. The hastati unit apparently had been increased in number to 1,200 per legion (10 maniples of 120 men each) according to Smith, William (1875), a dictionary of Greek and Roman Antiquities. Little, Brown, and Co. p. 496. The rorarii and accensi indeed long disappeared and the Leves replaced by much more potent velites, attached to principes and triarii. In pitched battles they would skirmish to cover the advance of the hastati. So they retreated and the enemy was perhaps expecting melee combat, only to be showered by a sudden rain of heavy javelins (the Velites would have carry a bunch of light wooden, iron-tipped javelins). When in close contact, the Hastati would have been used to thrust rather than slash already, taking advantage of the rather short but extremely sharp and thick gladius, ensuring maximal penetration and damage in the enemy vitals. As customary, the gruelling "sword job" was designed to use at best the shield in one hand to parry the sword blow and replicate by a nasty belly-high stab. A favourite especially against "barbarians" usually raising their weapon high before the slashing blow, leaving their vitals unprotected, almost offered to the Roman meat-cleaver. What is clear about their tactics is they probably had a way more professional and well thought, well rehearsed sword play after Scipio's reforms in Spain, using the Gladiatory schools intensive training as a model. If the Hastati, still in their twenties, failed to break the enemy, they would fall back on the Principes, second in line in the triplex acies and in the quincunx formation. For some othors they would have wielded spears or heavy pila by preference and could have been re-armed with swords in that occurence. Of course as famously said in the popular Latin expression "falling on the triarii" of utter despair and last resource, when a situation was totally compromised. If the Principes themselves in their thirties failed to break the enemy, they would retire behind the triarii, as described by polybius, "lowering one knee, the shield firmly planted in the ground as well as their long pike tail". Pure defensive unit, although short in numbers these grizzly veterans in their forties-fifties had the same gaps between units, generally half the size of normal maniples, and would have brace and hold their ground enough to allow both the Principes and Hastati to regroup and come back to the melee. Although that order was religiously kept, there were rare exceptions: At the battle of the Great Plains, Scipio, started to form his men up in the usual manner, but once the hastati were engaged, he sent his principes and triarii as flanking forces, in the way the Carthaginians often used against the Romans. At Zama, Hannibal's victor had his units formed into columns with large lanes in between to let pass the elephants through, used as killing grounds by velites. They reformed just after, into a long line with his triarii and principes, centre and more mobile hastati on the flanks to face the Carthaginians, in a way many armies (including the Gauls) did. He was perhaps the most inventive Roman general so far. Arguably the major reformer of the Roman army overall was Gaius Marius, which completely transformed the Roman Army towards the same movements already initiated from the origins and complicated seven-levels citizen soldiers style, to a very homogenous, one infantry type (with added local auxiliaries) amry. He made the army professional and paid, to combat shortages from recent Jugurthine and Teutonic wars. This changed a lot at any levels in the Roman society, and helped cement an Empire based on Miles with strong clientelist bonds between a consul and his troops (which led much later to "emperors walz" and praetorian's own intrigues). To create his army, Marius took the Principe as a model for a state-equipped standard heavy infantry. Therefore, the Hastati was gone, although these uniform legions still had, possibly at the beginning, diverse levels of equipment depending on the way it was provided, and therefore the best could have been given to the most precious troops, veterans. Also inside a quincunx, there could have been a gradation of troops by age within the Legion itself (ie younger maniples forward), and within a single unit, especially before the "rotating system" of rest-and-combat was practiced. The legion was then displayed in three unbroken lines, so the old experience-based gradation could have been still assured inside each unit rather than legion-wide. By then the Roman army was a perfectly oiled, finely tuned human and steel meat grinder, the ultimate war machine that can be presented against any foe and yet be successful even under a green wannabe commander.